I recently had the pleasure to try Nestle’s Wonka Exceptionals Chocolate Bars. Let me start by saying one must be rather sure of the deliciousness of its product to name it “exceptional” anything. I can affirm this title and say exceptional is pretty accurate. Maybe a bit of an exaggeration, but not far off because they are REALLY good. The Domed Dark Chocolate Bar is pretty tasty. 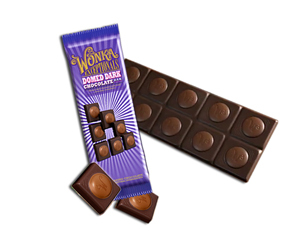 It’s a good quality dark chocolate with a dome of milk chocolate perched in the center of each square. It’s definitely for the adult palate as is most dark chocolates. I can’t recall being a big dark chocolate fan as a kid. 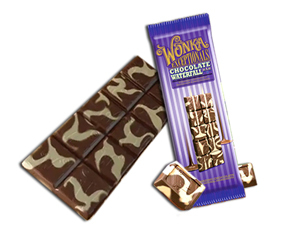 The Chocolate Waterfall Bar is a swirl of milk and white chocolate. Usually, I think white chocolate is too sweet, but the swirling combination of white and dark chocolate totally negates the super sweetness of the white chocolate. It’s like a milk chocolate bar with a swirl of white chocolate and it’s perfect. Smooth, creamy and yummy. Very good… dare I say… exceptional?! I give these bars 5 Bonbons! Candy Addict received this product as a sample from the manufacturer. No payment was received for this review and all opinions represent an unbiased view of the product. i wanna eat chocolate wonka, looks so creamy & yummy. I can’t believe that they didn’t send you the Scrumdiddlyumptious bar. A chocolate bar with bits of toffee, nuts and some sort of cookie/wafflecone-ish crisp. I got the individually wrapped package (with the intention of sharing), it was AMAZING! I could not stop eating them, and not only because I was looking for a golden ticket. Where do you buy them? They have the most annoying ads on Adult Swim so I assume there are just terrible, but I would still like to try them. They look really cheap but online it said they cost $4 a bar. Is this true? I can get Lake Champlain bars for $2.50, so they seem to be overpriced for such looking crappy chocolate. But then I haven’t been able to try one, so what do I know?